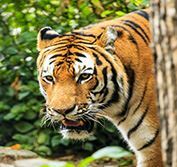 Combine bustling Mumbai, with Bandhavgarh National Park - renowned for some of the best tiger sightings in India. Afterwards fly to beautiful Kerala in southern India, with its tranquil lakes & backwaters. Visit Kumarakom & stay overnight on a traditional rice houseboat. Complete your holiday relaxing on Mararikulam beach. English speaking city guide, private driver, jeep safaris & sightseeing included. You will be met at Mumbai Airport by your driver and transferred to your hotel in this bustling city. Today enjoy a full day sightseeing tour of Mumbai, starting with a 1-hour ferry ride to Elephanta Island - originally called Gharapuri ("Fortress City") but renamed by the Portuguese who found a large stone elephant here. The Elephanta Caves date from between 450 to 750 AD and are now a World Heritage site, containing gigantic rock effigies of the Hindu faith. One of the most interesting of the large sculptured panels is the three-headed Shiva - shown as the Creator, the Preserver and the Destroyer. Another Shiva panel shows the God dancing the 'Tandava' and thereby causing the world to shake. Afterwards your tour continues with visits to the Gateway of India, the Prince of Wales Museum, Crawford Market, Jain Temple, the beautiful Hanging Gardens, the circular Tower of Silence, Gandhi's house at Mani Bhawan and the open-air laundromat at Dhobi Ghat. Note: Price of Wales Museum is closed on a Monday. Transfer to Mumbai Airport for your flight to Jabalpur. Here you will be met and transferred 4-hours to Bandhavgarh National Park - once the hunting reserve of the royal family of Rewa and today one of the most famous tiger reserves in the world. Covering 168 sq miles (437 sq km) of bamboo, grassland and deciduous forests in the Vindhya Hills of Madhya Pradesh, this reserve is where the amazing white tigers were discovered. Today is devoted to the wildlife of Bandhavgarh National Park on a shared jeep safari. Early morning is the best time to track tigers and other wildlife, but be aware that it is extremely difficult to find tigers in the jungle and sightings are never guaranteed. Best viewings are generally at the end of the dry season (March to May, although it is extremely hot from April onwards), when the tigers search out the waterholes - but you need to take at least 4 game drives for a good chance of a sighting. In the afternoon return to the park for another shared jeep safari before dinner. There are many bird species as well as mammals such as sloth bears, langur monkeys, wild boars, wild dogs, mongoose and three types of deer - chital, sambar and barking. Please note we always try to book jeep safaris, but these can only be reserved 120 days in advance and cannot be guaranteed - in which case your game drive will be in a 20-seater canter. In the winter months, morning safaris require warm clothes including woolly hats and gloves to protect you from the wind chill in your open vehicle. Transfer 4-hours to Jabalpur Airport for your flight to Mumbai and onward connecting flight to Cochin in the beautiful southern state of Kerala - fondly called "God's own Country". This Arabian seaport, now known as Kochi, was at the centre of the spice trade for many centuries. On arrival enjoy a city tour of Cochin - known to the ancient Greeks, Romans, Jews, Arabs and Chinese as an important trading centre. The Portuguese established the first European settlement in India here and the city was later colonised by the Dutch and then the British. Visit St. Francis Church built by the Portuguese, where explorer Vasco Da Game was first buried. Also see Mattancherry Palace (also known as the Dutch Palace) with its old murals depicting scenes from Hindu legends associated with Shiva, Vishnu and Krishna (closed Fridays); Jew Town and the Jewish Synagogue (closed Fridays & Saturdays). Time permitting, you can also visit the Dhobi Khana communal wash-house run by the Tamil community, or the pilgrimage church of St George in Edappally, one of the oldest and largest churches in India. Then walk to see the old shore-operated Chinese fishing nets at Fort Kochi, each operated by a team of up to six fishermen. In the evening a special treat awaits - a performance of the famous Kathakali classical dance. This morning your driver will collect you from your hotel in Cochin and introduce you to the beauty of rural Kerala, as you travel 2.5-hours to the small town of Kumarakom, situated on Vembanad Lake - the largest backwater in India. Check into your hotel and relax surrounded by these tranquil waters. At leisure to relax and enjoy the leisurely lifestyle and wonderful food of Kumarakom on Vembanad Lake - an important habitat for many marine and freshwater fish species and shrimps. Kerala is famous for yoga and ayurvedic spa treatments. Bird watching is also outstanding, with nearby Kumarakom Bird Sanctuary offering a safe refuge for many migratory birds. Sunset boat rides, pedal boats and fishing are available from some hotels (pay locally).